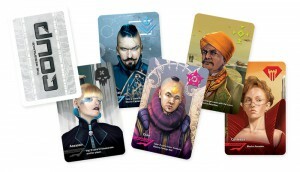 The newest Kickstarter project by Indie Boards And Cards is a retheme of last year’s The Coup by Rikki Tahta into the The Resistance universe. The Resistance: Coup is a quick but juicy bluffing and deduction game: each player has two character cards under his influence who’s actions he may use with no risk associated. He may also use the actions from cards he doesn’t have, but there’s a risk involved: if another player guesses that you do not have that card and calls you out on it, you lose one of your cards. If, however, you have the card you are suspected of not having, the player who called you out loses one. Lose both your cards and your out of the game. Very simple rules, good player interaction and the illustrations are rather cool as well. In July, SJG will release Beau Beckett’s Castellan, in which two players build a castle together, but only the player who finishes a courtyard scores points for it. Which pieces of the castle you may play is dictated by your cards. With two sets of the game (one in red/blue and one in green/yellow) you can play with up to four people. The predicted $70 for two sets is a hefty price tag, but you do get 108 plastic pieces in each box for it. The title Belfort: The Expansion Expansion called out to me at once, the duplicate word just didn’t make sense to me at all. But reading about it on the Kickstarter page, it starts making sense: it’s an expansion to Belfort in which you build expansions to the buildings of Belfort. Obvious, right? On top of the expansions and their special scoring opportunities, you get assistants with special abilities to make your life as an architect slightly easier. A different basic rule of the game is not the only thing that changes with every game of Seasons: Enchanted Kingdom. You’ll also receive different special abilities through the special ability tokens, but we don’t know yet if those will be drawn before the game starts or if you earn them during the game. What we do know is that not using your’s smartly will put you at a big disadvantage. German distributor Pegasus Spiele will bring the games from French publisher Matagot to Germany and Austria. Matagot is well-known for their mythological strategy game Cyclades. Kemet, Cyclades‘s Egyptian offspring, will be one of the first games available in German through Pegasus. In return, Matagot will make Junta available to the French games. 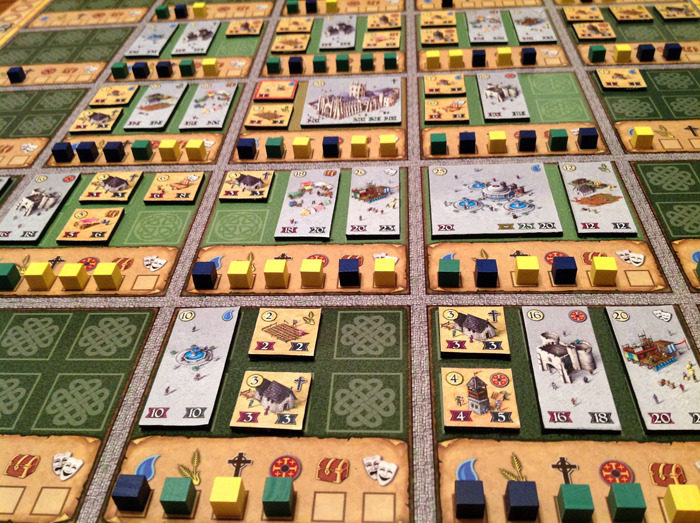 The first game by Quixotic Games, currently on Kickstarter, is a big project: building the city of Canterbury in the 6th century, just after King Ethelbert decided for it as his capital. And the game itself will be on the large side as well, if the photo of the prototype is to be believed. Large, and pretty. The game draws some inspiration from computer games like Sim City, and so you will build the city with different buildings, in different districts, and with every building the city grows richer and allow the construction of more buildings. For everyone. And don’t doubt the game will be awesome for a moment, because lead designer Andrew Parks already has some games to his name, among them Stronghold Games’ Core Worlds. Village Inn, the first expansion for 2012 Kennerspiel des Jahres winner Village, is now available. The expansion, like the base game design by Inka and Markus Brand, adds a new craft to the game: you can now brew beer, to be used in the inn to gain favours from the other guests. All for a good spot in the village chronicles, of course. Village Inn also includes material for a fifth player. And the price for best subtitle for a game this year goes to: Euphoria: Build a better Dystopia. Jamey Stegmaier and Alan Stone have moved a long way away from peacefully running a vineyard in Viticulture with their second project, a worker placement game set after the apocalypse, where knowledge of the past is suppressed and thinking for yourself discouraged. Euphoria has more than one way to victory and many interesting ideas in the details: for instance, knowledge makes your workers more efficient, but let them have too much knowledge and they might desert you. I’m very much looking forward to this game, which will launch on Kickstarter soon.